POPE Benedict XVI has greeted the faithful for the last time as pope, telling well-wishers that he is beginning the final stage of his life as "simply a pilgrim," hours before he becomes the first pontiff in 600 years to resign. Benedict arrived at the Vatican's vacation retreat at Castel Gandolfo after an emotional sendoff from the Vatican. His closest aide wept by his side as he bade farewell to Vatican officials gathered in the courtyard of the Apostolic Palace, Swiss Guards standing by at attention. Bells tolled as the pope left the Vatican by helicopter and circled St. Peter's Square, where banners reading "Thank You" were held up skyward for him to see. 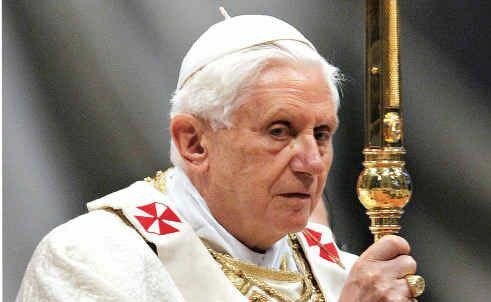 The bells tolled anew as he arrived in Castel Gandolfo, whose central piazza was jammed with people eager to catch the last glimpse of Benedict as pope. To a roaring cheer, Benedict, 85, appeared at the balcony of the palazzo where he will spend the first few months of his retirement. He said he was happy to be "surrounded by the beauty of the Creator" on this unique day. As of 8pm, he said to applause, he would no longer be pope. "I'm simply a pilgrim who is beginning the last stage of his pilgrimage on this Earth," Benedict said, as well-wishers wiped tears from their eyes.